In digital radiographic system there is a variety of imaging noise, which originates from most of elements of the system, such as CCD camera, imaging screen, X-ray source, inspected object, controller circuits and ect. They influence on imaging quality seriously. Therefore, many techniques have been applied to depress the noise through improvement of imaging element and image processing. Using collimator, shielding CCD camera from X-ray radiation, summing of the frames are usually accepted to reduce the random noise, and these measures have been proved to be effective. Aimed at the noise performance in DR system, it has found that some kinds of noise hidden in the background are regular in every acquiring image, and it is impossible to remove them by summing of the frames in the paper. The source and characteristics of the noise in digital radiographic system are researched by experiments and the methods of noise removal are given. It is shown that the methods are effective through practical application. Digital radiography(DR) has been applied widely in many fields. In digital radiographic system the inspection of defects depends on the imaging quality, which is determined by some factors, such as image noise. More noise in an image will degrade the ability to identify the defects of small size and low contrast when embedded in noise. Accordingly, the effective approaches to remove noise become urgent. Three ways of minimizing the quantum fluctuations are presented for radioscopy system. The image enhancement techniques[2-5] is usually used for depressing noise in general cases. However, one must consider closely the noise performance of DR system in order to take effective measure. In DR system the noise is originated from various elements, including X-ray source, CCD camera, imaging screen, inspected object, controller circuits ect. In the paper, the noise caused by every imaging elements is classified and analyzed through experiments and the methods of removing or correcting the noise are given. In digital radiographic system there are some of noise sources, such as CCD camera, imaging screen, X-ray source, object, controller circuits and ect., which affect the imaging quality seriously. But the kinds of noise originated from the system elements behave as different performances. X-ray digital radiographic system is shown in Fig.1. In the experiments, X-ray source with j 4 mm focal spot size, maximum tube voltage 300 Kv, tube current 5 mA, scientific grade CCD camera with ISD017A CCD chip(Silar Ltd.) by 1040 ´1160 pixels, 16m m ´ 16 m m each pixel size, 12-bit image format, and Nikkor AF50 mmf/1.8 lens, CsI(Tl) scintilator screen are employed. CCD camera is protected from X-ray with 50 mm thick lead(Pb) and collimator is used for depressing X-ray scattering. In view of the noise generation, the digital radiographic system is divided into the following parts: X-ray source, CCD camera, imaging optical system(including imaging screen, mirror and lens), control system(computer, controller) and object. Based on the later description and analysis, the noise in the system can be classified into several elements according to the noise properties, as shown in Fig.2. In Fig.2, CCD response nonuniformity is composed of the dark current nonuniformity and CCD response nonuniformity to light due to the defects in CCD; the imaging screen nonuniformity is originated from the difference of its response to the same X-ray radiation, isoplanatic distribution of image from the aperture effect and the uneven intensity of X-ray radiation, positive impulse noise from the X-ray effects on CCD, Gaussian noise from the CCD, control system, scattering noise from the object. CCD dark current noise indicates the current carrier created in a period of CCD accumulating time under complete dark. 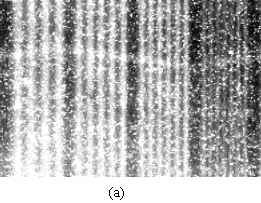 It consists of two parts, the first one is thermal noise distributing in Poisson stochastic process and forming the background noise; another one presents impulses, called CCD dark current nonuniformity in the paper, which is caused by CCD pixel defects. The former has less influence on imaging quality than the latter. The CCD dark current noise behaves as the one that superposing into the practical image. In order to analyze CCD dark current noise, an experiment was made. Capturing 25-frame images in complete dark environment for 60s accumulating time, the gray level of a row in a frame is shown in Fig.3(a). Fig.3(b) represents the average gray level of 25 frames in the same row. Subtracting Fig.3(b) from Fig.3(a), the result is shown in Fig.3(c), in which the impulse noise is removed completely. Fig 3: Brightness curves of a frame (a) and multi-frame average (b), (c) obtained by subtracting (b) from (a). CCD response nonuniformity to light indicates the nonuniform degree of the response of CCD pixels to light under even illumination. It is determined by the homogenization of the CCD material and its process engineering. Because of the difference of the CCD pixels, the gray level of a image under even illumination fluctuates at random in the spatial domain. But in time sequence, each CCD pixel response varies regularly according to the following experiment. Under even illumination, no X-ray radiation and the same capturing condition, n-frame images, each frame with 1024 ´ 1024 pixels, were acquired with CCD camera. Because of the average, the random noise is suppressed, SNR(signal-to-noise ratio) improved by n1/2. The outline P(Ai) of each row Ai of image A is gotten by fitting with polynomial, i=1,2,3,...,1024. Let Ui = Ai-P(Ai), i=1, 2,..., 1024. The nonuniformity of CCD response to light and random noise are included in Ui. Making the same process for one arbitrary frame B of n-frame images, let Vi=Bi-Q(Bi), i=1,2,...,1024. The correlation coefficients ri represents the degree of linear correlation between one image and the summing one. The correlation coefficients of 1024 rows are calculated and shown in Fig.4 by experiments with 18-frame images under no X-ray radiation and 5s exposure time. In Fig.4 the correlation coefficients of most of rows reach about 0.97. Accordingly, there must be invarible factor in CCD response to light. To test the characteristic of nonuniformity of CCD response to light, the subtraction operation was made. Fig.5(a) represents the gray level of a row in one image of 18 frames, and Fig.5(b) represents the average gray level of 18 frames in the same row. Subtracting the invarible factor Ui from Fig.5(a), the corrected result is obtained, shown in Fig.5(c). It is obvious that the nonuniformity noise is removed greatly. Imaging screen response nonuniformity to X-ray radiation indicates the nonuniform degree of the response to X-ray radiation on the imaging screen because of the different luminous efficiency of the crystals on every tiny field of the screen due to its manufacturing limitation leading to uneven thickness, purity and so on. The serious nonuniformity causes the stripes, bright or dark spots in the image, which may be mixed with the inspected defects of the object. Hence, it is necessary to correct these false defects by image processing. Isoplanatic distribution of image indicates that the gray level reduces gradually from the center part to the border in the image. It is caused by the aperture effect and the intensity distribution of X-ray radiation(maximum in center). The correction of the isoplanatic distribution can give the actual gray level and improve the visual effect. By fitting the background image with polynomial, then subtracting the polynomial term from raw image, the corrected image can be obtained. But only when the background image matches the raw image in brightness, the image is corrected well.The following will describe a better approach. In digital radiography CCD chip may be radiated by X-ray, which causes the positive impulse noise in the captured image. In order to study the influence of the kind of noise on the image, an experiment was made. The noise caused by X-ray behaves as positive impulse noise instead of salt-pepper noise and its spatial distribution in the image is at random. The density and the amplitude of the noise increase with the camera exposure time. Other experiments show they increase with the intensity of X-ray radiation also. The impulse noise has a serious effects on the image quality. Hence, the shield of CCD camera should be taken into account in the system. Using nonlinear method, such as median or sub-minimal filtering, can remove the noise well. y0 is called background image. In the experiment, firstly 18-frames dark current images were acquired under 60 s exposure time. Then 25-frames background images, including the CCD response nonuniformity to light and imaging screen nonuniformity, are achieved on the DR system shown in Fig.1 under the condition of 10 mm constant thick steel plate placed in front of the imaging screen, 200 Kv tube voltage, 5 mA tube current, 78s exposure time. Summing up the dark current images and background images respectively depresses the random noise to obtain the new dark current image D and background image Y0. Finally, the resolution chart (1,1.6,2.0,2.5l p/mm spatial resolution) was placed on one side of the steel plate to get the radiographic image shown in Fig.7(a) under the same condition. Using equation (6) to correct the image noise and eliminating the positive impulse caused by X-ray effects on CCD with median filter under 3 by 3 window, we can obtain the clean image, shown in Fig.7(b). We can see that the image quality is improved after correcting the nonuniformity of the CCD and imaging screen and eliminating the impulse noise. The majority of the noise in DR originates from CCD camera, imaging screen and the X-ray radiation to CCD, which dominate the image quality. 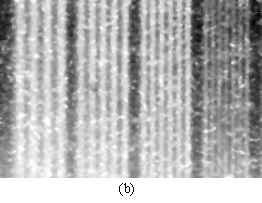 Dark current nonuniformity is CCD inherent character due to the CCD defects and appears to be a series of impulse signal. The impulse amplitude is proportional to the exposure time and greater largely than the dark current background noise. CCD response nonuniformity to light is inherent character. It has more serious influence on image than dark current nonuniformity. Imaging screen response nonuniformity to X-ray radiation depends on the screen quality. It may cause false defects in NDT. Three kinds of nonuniformity above and the isoplanatic distribution can be removed or corrected by means of the method presented in the paper. A majority of impulse noise is originated from X-ray radiation effects on CCD. The density and amplitude of impulse increases with the CCD exposure time or the intensity of X-ray radiation. So there should be enough shields protecting the CCD camera from X-ray radiation. Halmshaw, R., Industrial Radiography, 2nd edition, Chapman&Hall, 1995, P.267. Burch, S., Digital enhancement of video images for NDT, NDT International, Vol.20, No.1, 1987, pp.51-56. Throup,D., Improving images from real time radioscopic sources, X-Ray Real-Time Radiography and Image Processing, R., Halmshaw, Ed., Sym. British Inst. NDT Newbury, Berkshire, 1988, pp.87-95. Pratt, W., K., Digital Image Processing, John Wiley & Sons, Inc., 1978, pp.307-342. Chen, S.,Y., Image enhancement for X-ray digital radiography, 3rd International Sym. on Test and Measurement, China, 1999, pp.587-589.